Details WARNING! CONTAINS MERCURIC SULFIDE. Read the Material Safety Data Sheet (MSDS) for precuations on handling this pigment. Vermilion, a dense red mineral, is made by subliming a mixture of mercury and sulfur, and is usually described as an intense reddish orange or sometimes as a dark reddish purple. Vermilion varies in masstone color from strong red to vivid reddish orange in Munsell range from 5R to 7.5R. Our vermilion is red mercuric sulfide made from ore deposits in the Huan province of China and prepared according to an Chinese ancient process known as the "dry process." It exhibits a beautiful masstone color of strong red with a tendency toward reddish orange. Alternate Names: Vermilion is the standard name in English given to the red artists' pigment based on artificially made mercuric sulfide, while cinnabar is the name given to the natural mineral. It is an historical pigment but surprisingly not found in ancient Egyptian or early Mesopotamian objects. It was well known to the Romans and widely used in China since the third millennium B.C. Vermilion is a red crystalline form of mercuric sulfide made artificially since antiquity. The red native mineral is of secondary origin and known as cinnabar. Cinnabar has the highest refractive index of any other known mineral, its mean index for sodium light being 3.256, while the index for diamond—a substance of remarkable refraction—is only 2.42. It was mined by the Romans for its mercury content and it has been the main ore of mercury throughout the centuries. Some mines used by the Romans are still being mined today. Cinnabar is found in all localities which yield mercury notably Almaden, Spain; Idrija, Slovenia; Landsberg, near Ober-Moschel in the Palatinate; Ripa, at the foot of the Apuan Alps, Tuscany; the mountain Avala, Serbia; Huancavelica, Peru; Kweichow and Hunan Provinces, China; Doneckaia region, Ukraine; and California, Oregon, Texas, and Arkansas, USA. Vermilion is obtained direct by subliming a mixture of mercury and sulfur. The product is ground and levigated; and when dry it is ready for use. It is also prepared by digesting precipitated mercuric sulfide with an alkaline sulfide; it is said that Chinese vermilion owes its superiority to being made in this way. In addition to its brilliance, vermilion is a pigment of great intensity and durability, remaining unaffected by acid fumes. 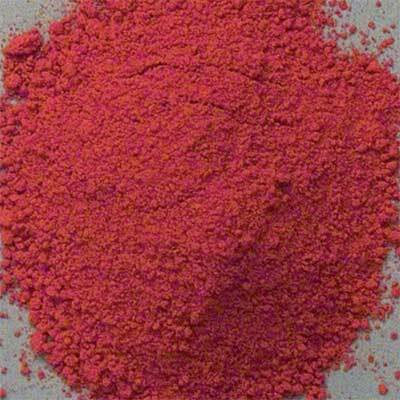 Some authorities today do not consider cinnabar to be a permanent pigment. However, samples have been known to withstand exposure to direct sunlight for at least ten years. It is remarkably unreactive with other pigments despite that fact it is a sulfide. In oil-medium, it was commonly used with lead white to produce flesh tints with no sign of formation of black lead sulfide. It was used on alkaline lime fresco walls. The traditional use of red glazes of madder, kermes and cochineal lakes over cinnabar underpaint not only increases the purity (chroma) of the color, but has been shown to reduce its tendency to darken. The natural mineral is said to be more stable than manufactured vermilion. 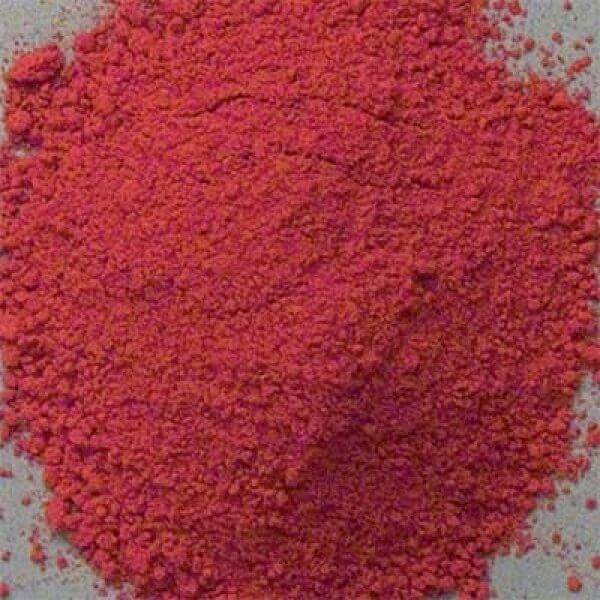 Although considered by some to be an erratic pigment, cadmium reds do not replace its special hue or physical characteristics. 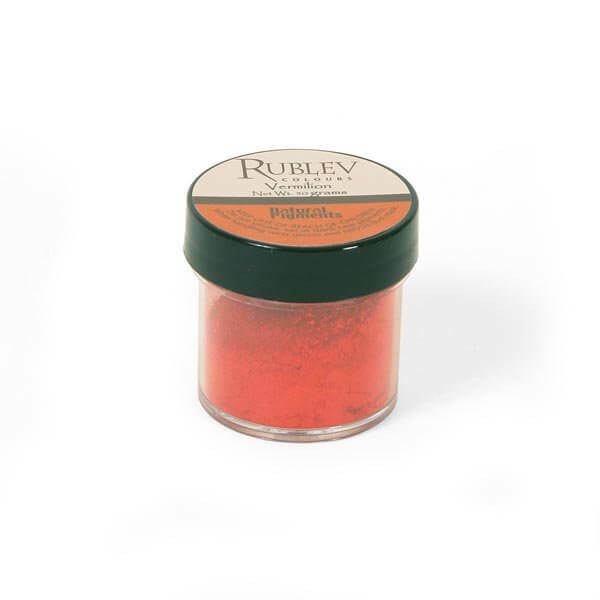 Vermilion absorbs a low amount of linseed oil when grinding the pigment in this medium. Linseed oil is very slow drying with vermilion, yet it produces a strong paint film. Some authorities consider natural cinnabar to be non-toxic. Anita Albus writes that the deadly poison of mercury becomes harmless when it is stably bound with sulfur. However, we consider cinnabar and vermilion to be toxic and urge caution in handling the dry powder pigment, as well as the pigment dispersed in medium.